Celebrate the red, white and blue in a Healthy Living Patriotic Trifle that's great for potlucks. 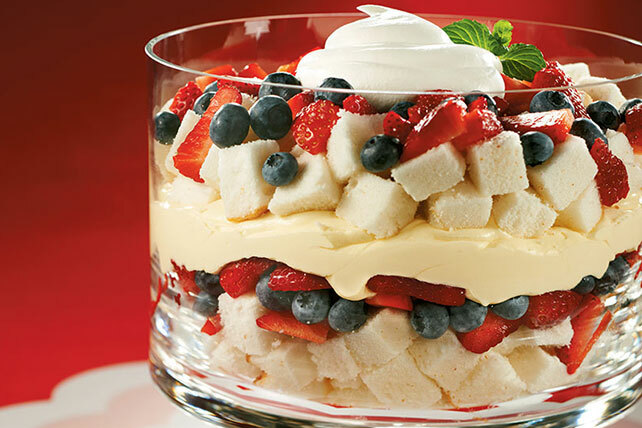 Bring this Patriotic Trifle to your next get-together! Beat pudding mix and milk in medium bowl with whisk 2 min. Stir in 1-1/2 cups COOL WHIP. Layer half each of the cake and berries in large serving bowl; cover with pudding mixture. Top with layers of remaining cake, berries and COOL WHIP. Garnish with additional strawberries, blueberries and fresh mint sprigs just before serving.